A cultivar of Camellia japonica L., ‘Althaeiflora’ has large, dark red, paeony-form flowers. [Hilliers’]. It was raised by Chandler in 1819 from Anemoniflora. [ICR]. ‘It is an excellent variety, the flowers being large and rich in colour, freely produced, and lasting long. It is increased by engrafting upon the single stock. Our drawing was made in November: through the warmth of the season many of the Camellias flowered then which usually open in spring. 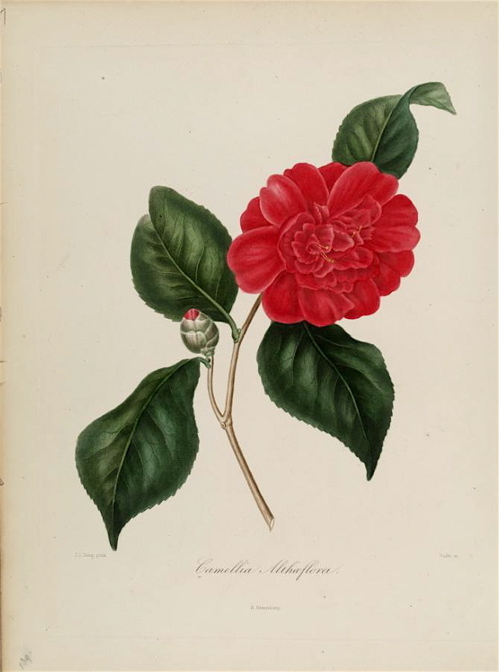 With occasionally a little artificial heat, this beautiful family might always be brought into flower during autumn and winter, which would be very desirable to persons residing in the country at that time, and removing to town in the spring; such are often complaining that they do not see their Camellias flower, from their absence.’ [LBC no.1794/1833]. The illustration used here is from Berlèse Iconographie vol.I pl.6/1841. Although listed in all published catalogues [T.194/1843] it was included among desiderata to Loddiges’ nursery on 6th January 1845 [MP A2933-2, p.28]. This suggests that an earlier importation had been lost.